Want to be notified of new releases in MattesGroeger/vim-bookmarks? This vim plugin allows toggling bookmarks per line. A quickfix window gives access to all bookmarks. Annotations can be added as well. These are special bookmarks with a comment attached. They are useful for preparing code reviews. All bookmarks will be restored on the next startup. Before installation, please check your Vim supports signs by running :echo has('signs'). 1 means you're all set; 0 means you need to install a Vim with signs support. 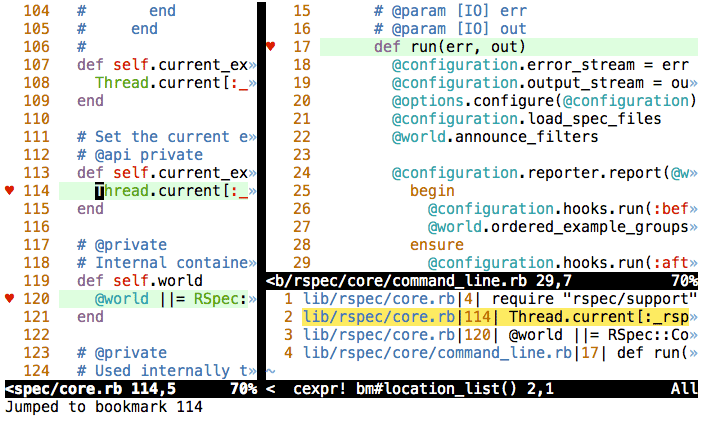 If you're compiling Vim yourself you need the 'big' or 'huge' feature set. MacVim supports signs. Put any of the following options into your ~/.vimrc in order to overwrite the default behaviour. This feature allows the grouping of bookmarks per root directory. This way bookmarks from other projects are not interfering. This is done by saving a file called .vim-bookmarks into the current working directory (the folder you opened vim from). Whenever a vim instance is opened from the same root folder the bookmarks from that folder will be loaded. Note, that you can place your bookmarks in any file underneath the working directory, though. You should add the filename .vim-bookmarks to your (global) .gitignore file so it doesn't get checked into version control.
" Finds the Git super-project directory. This feature implies bookmark_auto_save. When configured bookmarks will be loaded and saved on each buffer change. This allows working with different buffers/tabs and keeping a different bookmark file for each one based on the file open in the buffer. I.e., using the following function and having files from different Git repositories open in different tabs will use a different bookmarks file per Git repository. This is different from how saving per working directory works because it allows for having different bookmarks for different buffers/tabs open in the same window without having the working directory change automatically when switching between them.
" Finds the Git super-project directory based on the file passed as an argument. Call functions BookmarkSave, BookmarkLoad and BookmarkClearAll with the last argument set to 0 to perform these operations silently. You may use this to manage your bookmark list transparently from within your custom script. Unite is a multi-purpose user-interface plugin platform. Vim-bookmarks provides a Unite source called vim_bookmarks so users who use Unite will handle bookmarks with the Unite interface. Additionally, when showing all your bookmarks, Unite is detected and the plugin will open :Unite vim_bookmarks instead of Vim's quickfix window. Note that g:bookmark_auto_close is no longer applied. Once opened, the window is managed by Unite. For more information about Unite, start reading :help Unite. ctrlp.vim is a Full path fuzzy file, buffer, mru, tag, ... finder for Vim. Additionally, when showing all your bookmarks, CtrlP is detected and the plugin will open :CtrlPBookmark instead of Vim's quickfix window. Note that g:bookmark_auto_close is no longer applied. Once opened, the window is managed by CtrlP. Why are the colours in the sign column weird? Your colorscheme is configuring the SignColumn highlight group weirdly. To change that add this to your .vimrc: highlight SignColumn ctermbg=whatever. What happens if I also use another plugin which uses signs (e.g. Syntastic)? Vim only allows one sign per line. Therefore bookmarks will override any existing sign. When removing the bookmark the original sign will show up again. In other words vim-bookmarks won't remove another plugin's signs. Why aren't any signs showing at all? How do I avoid keybinding conflicts with the Nerdtree plugin? You could unbind the keys whenever Nerdtree becomes active (thanks to @Nitive). Why do my bookmarks disappear when running the :make command? By default, the bookmark list is shown using the quickfix window, which can sometimes conflict with other commands. The location list may be used to show the bookmark list instead by setting the g:bookmark_location_list option documented above. See the release page for all changes. This plugin was developed by Mattes Groeger under the MIT License. Pull requests are very welcome.